The Sun Inn is a family run traditional 17th century Grade II listed Public House* with 6 bed and breakfast rooms. With a beautiful courtyard garden to enjoy in summer and a wood burning stove to warm the heart in winter, everyone is welcome to enjoy a relaxing time in The Sun. The bar is lively and well known for its live sports coverage, as well as its large range of drinks, including real ales and traditional 'rough' Somerset cider. 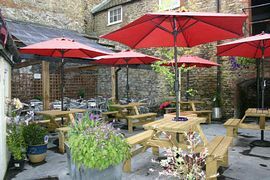 The beautiful courtyard garden is a wonderful sun trap and the perfect place to enjoy a drink AL fresco. 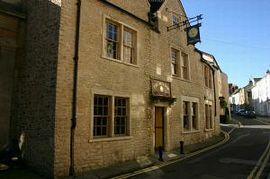 The Sun Inn's Bed and Breakfast, offers lovely accommodation just a few minutes walk from the town centre. Situated at the top of Catherine Hill in Catherine Street, the bed and breakfast accommodation is in the beautiful conservation area of Frome, convenient for both the town centre and some of the most popular tourist attractions in the South West. The rooms are spacious and well appointed and a full English breakfast is served in the breakfast room each morning. 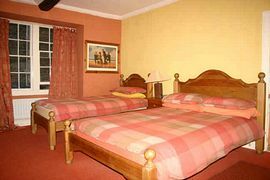 The accommodation consists of 6 delightfully spacious bed and breakfast rooms*. Each room has tea and coffee making facilities and a television. The 4 main rooms have en-suite facilities. The 2 single rooms have a basin in the room and share a separate private bathroom. A hairdryer, iron and ironing board can also be provided upon request. *Please note that even though we have family rooms available, unfortunately licensing restrictions mean that no persons under the age of 18 will be allowed access to the bar or garden. A full English breakfast is included in the price of the room and is served in the breakfast room (8-9am Mon-Fri; 9-10am sat/sun). A 3-course breakfast is served each morning; toast and preserves followed by a selection of cereals and finally a full English breakfast. Tea, coffee and juices are also provided. Our closest and most popular attraction is Longleat House and Safari Park located just 4 miles away. Other nearby attractions include; City of Bath; Cheddar Gorge; Glastonbury Tor; Salisbury Cathedral; Stonehenge; Stourhead; Wells Cathedral; Wookey Hole Caves. Guests may be able to collect their keys from 11am by prior arrangement. However, access to the rooms and facilities will not be allowed until 2pm. We find this is a useful service, for those attending weddings at the nearby Orchardleigh and Babington House, who need to drop off their luggage.